I have often praised WBGO-FM's "The Checkout", a show heard every Tuesday evening and which I download from iTunes. Last week, they began a 2-part show honoring the 2010 NEA Jazz Masters. The show featured interviews with vocalist Annie Ross, producer George Avakian, and pianist/composers Muhal Richard Abrams (pictured) and Cedar Walton. Each person is fascinating in her or his own right and worth your attention (click on the show name above to find out more.) This week, the spotlight turns on pianist Kenny Barron, composer/arranger Bill Holman, vibraphonist Bobby Hutcherson, and reed master/educator Yusef Lateef. If you listen "live", you can hear the NEA Induction Ceremony following "The Checkout." Perhaps, the best "new music" label in the few years has been Clean Feed. 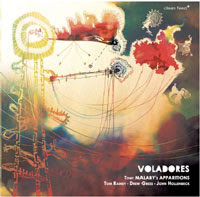 The label, based in Portugal, has released a high number of quality in the past half-decade and starts 2010 off with a bang with the release of "Voladores", music by Tony Malaby's Apparitions. The tenor saxophonist surrounds himself with class musicians including bassist Drew Gress, drummer Tom Rainey and percussionist John Hollenbeck (all great players.) 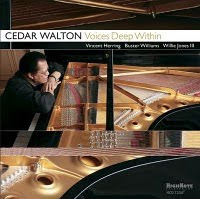 If you want to get a taste of this fine music, go to www.emusic.com and search for the CD (you can also click here.) I'll post my review in a few weeks but, from initial listening, this music is fiery and involving, hard-edged jazz that keeps one guessing.